Whoever said imitation is the highest form of flattery wasn’t living in the digital age. As soon as the Quirky Pluck Yolk Extractor showed up on the crowdsourcing site, the copycats got in on the action. Now there are tons of yolk tools available. (Here’s what a yolk search in the Home & Kitchen department on Amazon will get you.) While the original yolk extracting design was elegant in its simplicity, it lacked any pizzazz. And it looked nothing like a fish. 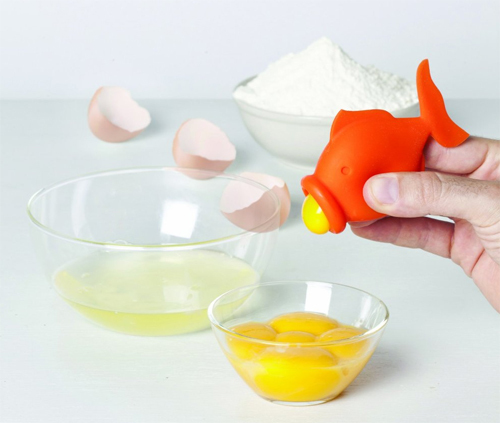 While the original idea for the egg gadget was clever, the Silicone YolkFish Squeeze Fish Lips Swallow Release Egg Separator Cooking and Baking Tool by Peleg Design takes it (and its product title) one step further. The idea of using a fish to fish for egg yolks is certainly cute and the egg separator does offer a fun whimsical shape, but at the price they are asking for it, the thing might as well be shaped like a cash cow — at least until the next thing wanders or swims along. Whoever said fish doesn’t grow on trees was wrong. (I’m sure somebody, somewhere once may have said that. Maybe.) 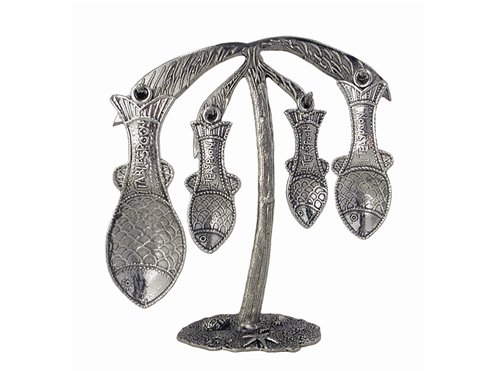 All it takes is one quick look at the Crosby & Taylor Fish Measuring Spoon with Pewter Palm Tree Post to put that fallacy to rest. Clearly, fish do grow on trees. Especially when they are both made of pewter. For those who love palm trees and fish, this set is a perfect combination of the practical and the innovative. Palm trees and fish. Together at last! It should come as no surprise that fishing and drinking are two activities that go well together. But fish and drinking? As in drinking fish? Sure, why not? They seem to like liquids. 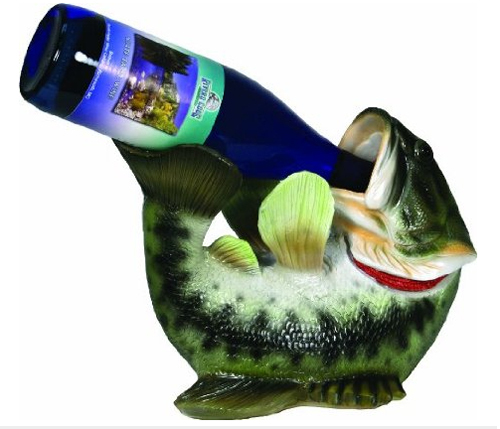 It is certainly the case with the River’s Edge Realistic Bass Fish Wine Bottle Holder . The hand-painted polyresin wine holder props up a standard sized 750-ml bottle for all to see. However, as most people are going to be distracted by the centerpiece, now might be a good time to try to sneak by a bottle of Two Buck Chuck. It can take years to be properly trained as a sushi chef. Or, with the help of a little magic, it can take minutes. Promising to “put the ‘U’ in sushi” (um, eww), Sushi Magic offers fresh-fish lovers an easy-to-use kit that gives everyone the ability to make sushi at home. 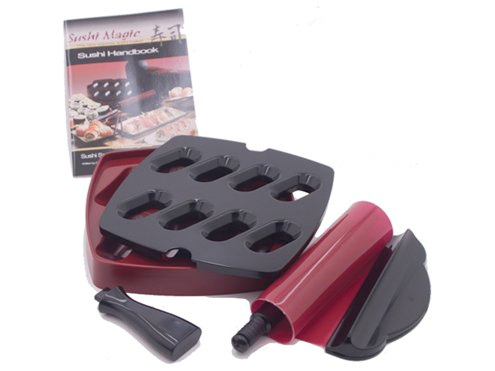 The kit contains a mold for making nigiri sushi, and a non-stick silicone mat for creating rolls. Included is a ‘sushi handbook’, which includes tips for selecting sushi-grade fish, and cooking sushi rice. While to some it may be somewhat disconcerting to have a fish spit in their drink, others apparently find the prospect quite appetizing. If you’re using the (Fish) Lemon Squeezer and you find your Lemon Drop cocktail a bit fishy tasting, well, I think you know what to blame. 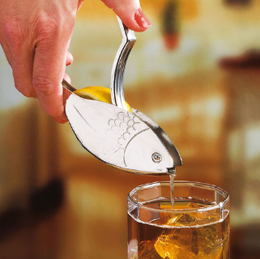 Of course, there’s no actual fish involved with this stainless steel, dishwasher safe citrus squeezer, but I don’t think looking at that engraved fish on the side would do anything for my aperitif. Perhaps that’s why this new squeezer is already on sale for $5.00. Get ‘em now, while they last. Grill baskets are wonderful things. Designed not only to hold delicate fish (or meats) for grill cooking, but also perfect for keeping small vegetables in place. Nothing quite beats marinated fire-roasted vegetables served with a perfectly cooked piece of fish. Problem is, sometimes without the right equipment it can be difficult to keep the food from falling into the fire. 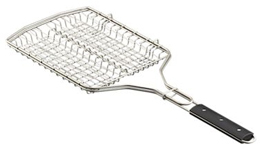 This Flexible Grill Basket is made from carbon steel and has a non-stick finish. The heavy-duty plastic handle makes flipping a breeze, while the flexible nature of the mesh allows for it to contour around your food. A sliding lock further helps to keep food from slipping out. When it’s all said and done, and your delicious meal is safely on your plate (or in your belly), cleaning up is simply a matter of popping the basket into the dishwasher.